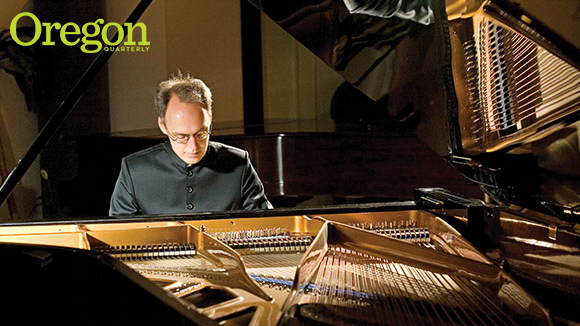 One day in the early 1980s, Michael Harrison, BMus ’83, noticed that his piano sounded out of tune. There was nothing wrong with the instrument, the UO music student soon realized. It was his ears that had changed. That realization set Harrison on a 30-year path that would lead him to become one of the most respected composers of his generation—lauded not just by major critics, who admire his innovations in tuning, but also by everyday listeners enchanted by his music’s ravishing beauty. Harrison’s quest began at the university. Partly inspired by a world music class he had taken with his primary mentor, former dean Robert Trotter, Harrison studied in California with one of the 20th century’s most renowned teachers of Indian music, Pandit Pran Nath. Singers of classical Indian music, like many in the rest of the world and in the West stretching back to ancient Greece, tend to find harmonies and melodic intervals based on simple ratios between the frequencies (3:2 for the interval of a fifth, for example, 4:3 for a fourth, and so on)—a concept called “just intonation.” But for the past century or so, much Western music, including Harrison’s piano, has used a very different “equal tempered” tuning that offered many advantages—at the expense of the sheer sonic beauty produced by natural harmonies. Harrison’s upbringing equipped him to handle the math he’d later use in his tuning experiments. His grandfather was a dean at MIT, and in the early 1960s, when Michael was six, his father, David, brought the family to Eugene, where he began a three-decade career teaching mathematics at the university. Michael began meditating in high school and studied yoga at the UO, where his interest in the connection between spirituality and music blossomed. But you don’t need math, meditation, or a background in Indian music to enjoy Harrison’s compositions. Harrison attributes his music’s approachable beauty to his Oregon childhood. Harrison’s mesmerizing 2012 release Just Ancient Loops garnered still more honors and spread his reputation ever wider as its performer, cellist Maya Beiser, recorded and toured it around the world. It also signaled new directions: after a quarter-century focused mainly on writing large-scale works in just intonation for piano, Harrison is now composing for larger ensembles and choruses and using electronic instruments, which make unusual tuning much easier. And Harrison has recently begun incorporating other aspects of the Indian music he sings every day into his new music for Western instruments. He’s cofounder and president of the American Academy of Indian Classical Music. Harrison devoted himself to exploring the beauty of those tunings in his own compositions, which made him a major figure in American contemporary music. In 1986, he created the harmonic piano, which could play 24 notes per octave instead of the usual 12, thereby setting the stage for his breakthrough: the aptly titled Revelation, a 90-minute suite for solo harmonic piano hailed by critics as a revolutionary accomplishment. And even though, after his epiphany of intonation, conventional pianos sounded out of tune to Harrison, he’s spent much of his life deeply involved with them. To pay the bills after moving to New York in 1987, he became a piano broker, and eventually cofounded Faust Harrison Pianos (and was later joined by his wife, Marina, an art historian) to restore vintage pianos. He left the successful firm recently as his composition career burgeoned, but still freelances helping buyers, including institutions, find the pianos they want. Michael Harrison has several well-regarded albums to his credit. His music has been performed at Carnegie Hall, Lincoln Center, the Metropolitan Museum, the American Academy in Rome, and the Sundance Film Festival. He has collaborated with such contemporary music ensembles as Kronos Quartet, Roomful of Teeth, and Bang on a Can. Brett Campbell, MS ’96, lives in Portland, writes for Oregon ArtsWatch, the Wall Street Journal, and many other publications, and teaches journalism at Portland State University.